All Blacks lock Tom Donnelly's tour of the northern hemisphere is over due to a knee injury suffered during the win against Ireland in Dublin. New Zealand head coach Graham Henry confirmed Donnelly would be unavailable for the final leg of the tour against Wales in Cardiff on Sunday. He is expected to be sidelined for up to a month, and will refocus on the inaugural Super 15 tournament with the Highlanders in February in a bid to strengthen his claims for selection in the World Cup squad. Brad Thorn, who missed the 38-18 victory at Aviva Stadium after straining a hamstring during training last Tuesday, is expected to combine with Sam Whitelock in the second-row against Wales - although the 35-year-old still has to pass a medical in order to celebrate his 50th test cap. "I would imagine he'll be 100 per cent. He's very keen," Henry said. "If he takes it gradually this week he should be right for Saturday." 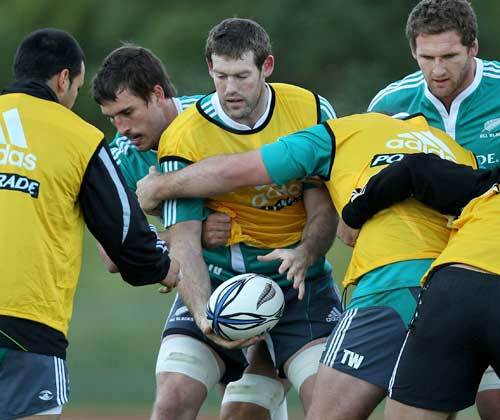 If Thorn does not recover, Whitelock and Anthony Boric - who impressed as the veteran's replacement against Ireland - will lock the scrum and blindside flanker Jerome Kaino will cover the second-row. "He subbed at lock in the test team," Henry said of Kaino. "If it came to the crunch, that's what we'd probably do." Henry ruled out summoning a replacement given there is only one game remaining. "Getting somebody else over who hasn't played rugby for quite some time would be difficult," he said. Donnelly is the second player to end this tour prematurely, following prop Ben Franks who injured his back before the Scotland test. Wing Sitiveni Sivivatu was expected to join the tour in London belatedly after recovering from a shoulder surgery but a subsequent knee injury meant he was not fit to travel.